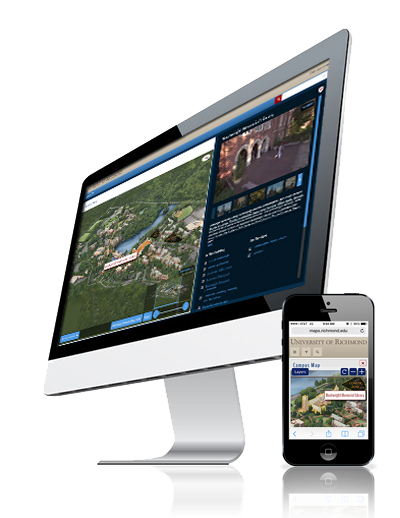 CampusTours WalkingTour is an affordable HTML5-based guided tour solution for any organization. Utilizing a series of video guides coupled with slideshows of still photographs, WalkingTour is able to persuasively convey the advantages of your organization's facilities, programs and community to your Web site visitors. WalkingTour is often provided in several languages, giving organizations the opportunity to reach non-English speaking audiences. All of our products are platform agnostic creating a seamless experience from desktops to mobile phones. Virtual reality scenes immerse visitors in your locations, creating an enveloping experience of sight and sound. Our products let mobile viewers know when things of interest are nearby based on their GPS coordinates. 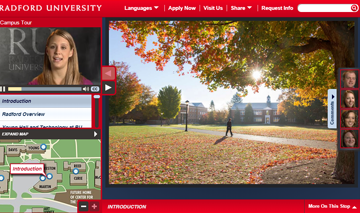 Radford University turned to WalkingTour when they needed a compelling guided virtual tour experience that works equally well in English, Spanish, Mandarin Chinese and Arabic. 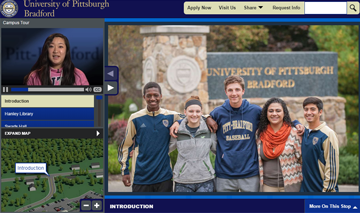 The University of Pittsburgh at Bradford wanted to showcase what goes on inside their buildings to prospective students and parents, so they chose WalkingTour. 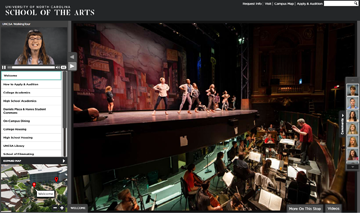 UNCSA is using WalkingTour to tell their unique and memorable story through guided tours, student commentary videos, panoramic images and supplementary videos.